In this tutorial, we are going to walk through how to use Capacitor to deploy iOS applications. 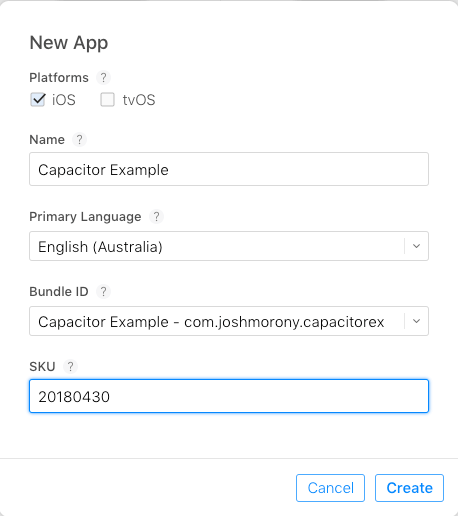 We will be covering how to get a Capacitor application running on an iOS device for development, all the way through to creating a build for distribution on the App Store. We are going to do this starting from a completely blank slate to demonstrate how to set up the appropriate environment from scratch. For this tutorial, I created a separate profile on a new computer so that absolutely nothing was installed or configured beforehand. Facilitating communication between the web application and the Native APIs of the device the application is running on. All you need to build your application with Capacitor is some web-based code to point it at, and so that doesn’t need to be an Ionic application (Ionic is certainly a great choice for developing a mobile app, though). If you would like a little more background on Capacitor before continuing, I would recommend reading An Early Look at Capacitor (A New Native Bridge for Web Apps. It is also worth noting that Capacitor is not just for iOS builds either, you can also use Capacitor to create builds for Android and Electron (for Desktop Apps). However, we will just be focusing on iOS in this tutorial. IMPORTANT: Capacitor is currently in alpha, so keep that in mind if you plan on actually distributing an application using it. The project does seem reasonably stable as it is now, but as with any alpha software you may run into breaking issues. Do I Need a Mac to Deploy to iOS? Borrow a friends machine – if you are using something like Ionic, you can do most of your development in the browser. Although it helps to have access to native builds, you may be able to get away with just borrowing somebody else’s computer to perform the build step. If you are able to get your hands on a computer with macOS that you can use on a frequent basis, it does help a great deal. In order to create iOS applications, you will need to enroll in the Apple Developer Program which has an annual fee of $99 for individuals and $299 for enterprises. 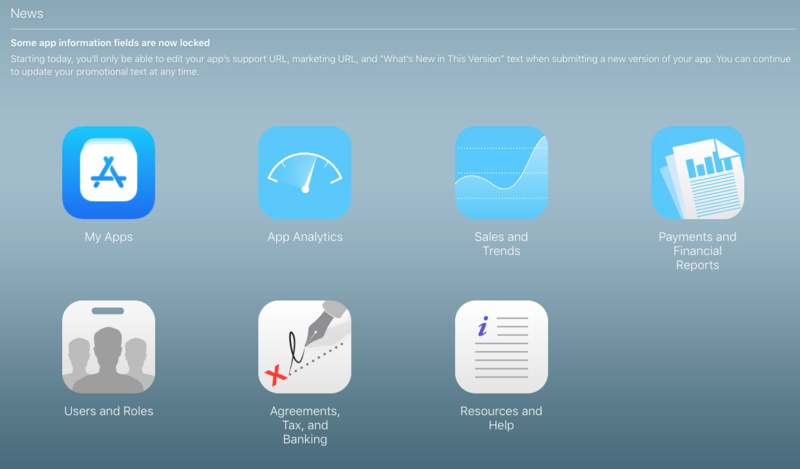 In order to run applications on your iOS device, and submit them to the App Store, you will need XCode. You can download this from the Apple App Store. In this example, we are using version 9.3 of XCode. Once you have installed XCode, make sure to open it at least once so that it can install the necessary components. You will need to have Node installed on your machine in order to use Capacitor. I would recommend downloading the LTS version of NodeJS from the NodeJS website. Make note of the identifier/bundle ID that you supply to Capacitor in this configuration step (e.g. com.example.yourapp). You will need to use this later to create an identifier for your application with Apple. From this point onwards, we are basically just dealing with a normal native project. We just have our web code bundled in there. In the image above, you will see a little play icon near the top left. This is what you will use to run your application. By default it will be set to ‘Generic iOS Device’, but if you have your own device plugged in via USB you will be able to set it to run on that. You can also choose a simulator to run the application in if you like. Let’s try and run the application now (make sure to attach and select your iOS device if you have one you want to use). When you are ready, click the ‘Play’ button. 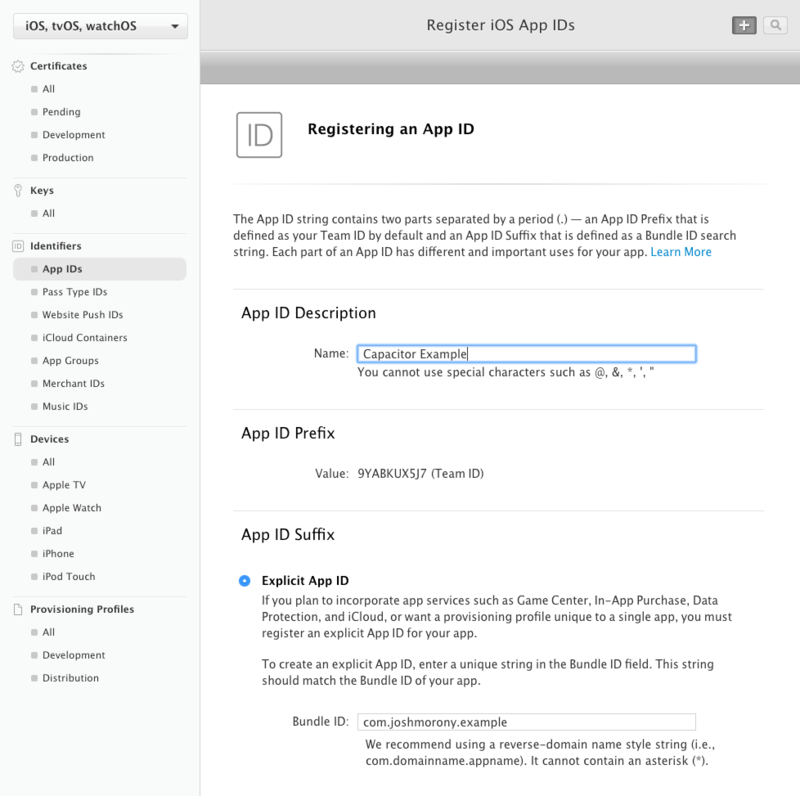 Apple requires that applications are “signed” in order to run on a device (and to be distributed on the App Store). This is basically a way to prove ownership of that application and to associate it with a particular Apple ID. In order to fix this error, you will need to set up signing for the application. Click the Add account button to add a development team. All you need to do here is sign in with your account that you purchased the Apple Developer Program for. Hit the ‘Play’ button again, and this time the application should be installed on your device. We have the application running on a device now, but there are a few more steps before we can distribute our application to everybody on the app store. Before distributing your application, make sure you are submitting a production build of your application, and have run npx cap copy to copy that build to your native project (and npx cap sync if required). NOTE: I will just be walking through the basic steps here. Submitting to the App Store is a lengthy process that involves setting up your splash images appropriately, supplying screenshots for the App Store, providing descriptions of the application, creating icons for the application and so on. If you are submitting your production application to the app store, make sure that you also complete all of these steps. Fill out the details on this screen. When entering an explicit App ID, make sure that it matches the ID that you supplied to Capacitor in the project initialisation (e.g. com.example.yourapp). Make sure that you also enable any services that your app requires. When you are ready, click Continue. Review the information on the next screen, and hit Register. In order to submit an application, we need to create a record for it in iTunes Connect. This is where we will be able to supply the screenshots, descriptions, pricing, and so on. Basically, all of the “meta” information for the application. It is also the interface you use for submitting your application for review, and for managing updates. You will need to make sure that you use the identifier that you just created. You can use whatever SKU you like, I just used the date in this example. Once you complete this step, you will be taken to the page that will allow you to specify all of the “meta” information for your application. Feel free to complete this now, or come back later and do it. Let’s head back to XCode now. You should change the target device near the ‘Play’ button back to Generic iOS Device. Once you have done this, go to Product > Archive, and you should see a screen with your application should pop up. The process of archiving is basically converting your application into the format required to upload it to the App Store. 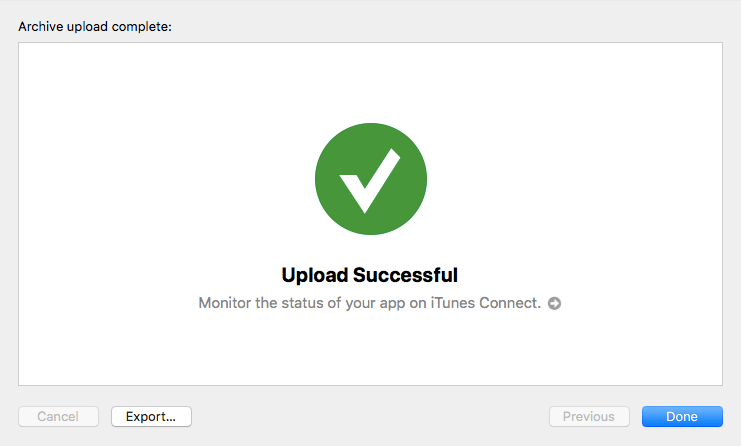 You will still have a chance to test your application through Test Flight once you have uploaded it to iTunes Connect (and you should definitely do this to make sure everything is OK before submitting for review). Click Upload to App Store. 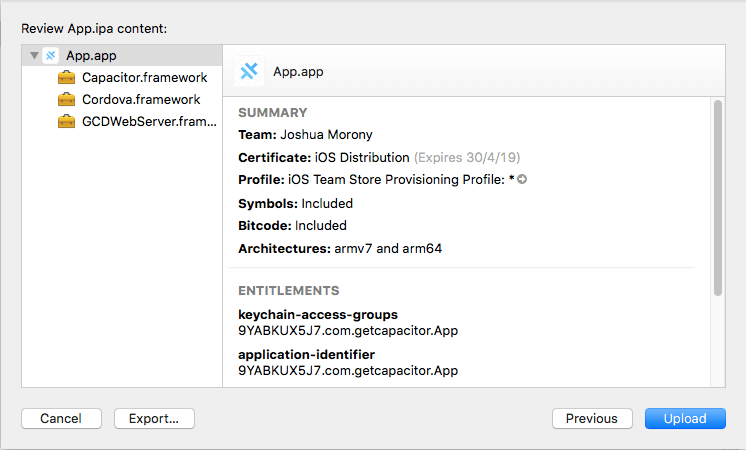 XCode will tell you that this app needs to be resigned for App Store distribution as it requires a distribution certificate, not a development certificate (which we can use to run the application on our own device). 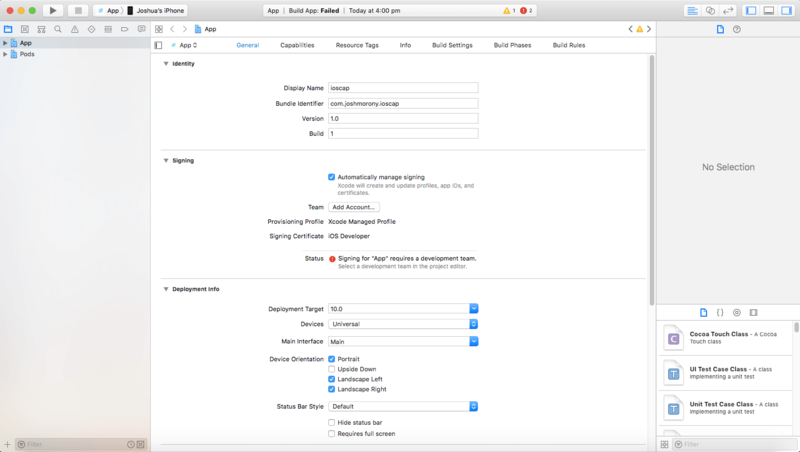 Unless you have reason to do otherwise, just use the Automatically manage signing option. 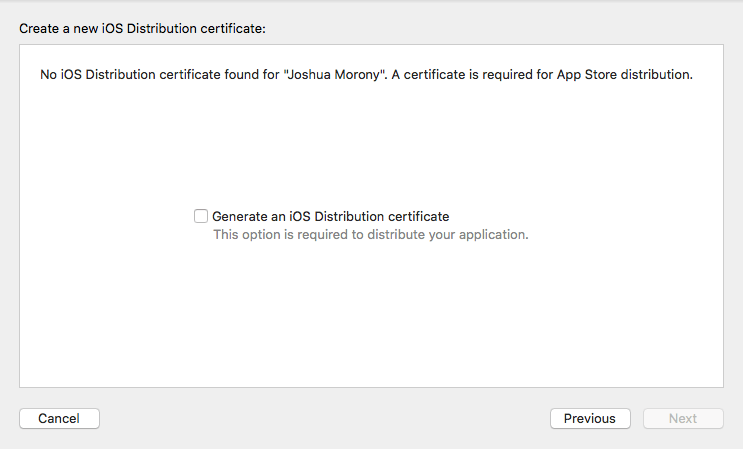 Just select, Generate an iOS Distribution Certificate and then choose Next. IMPORTANT: The next screen will inform you that the private key for your certificate is stored in the keychain locally on the computer. If something happens to your computer, or you forget your password, it means you will lose access to this. You should export this signing certificate and keep it somewhere safe. Once you have done that click Next. Woohoo!, almost there. Once the app is uploaded, you will be able to associate it with the app record you created in iTunes Connect. To do that, click on the current version of the application on the left of the screen (e.g. 1.0 Prepare for Submission). NOTE: You may not see any builds available right away, as it takes some time to process. You should receive an email from Apple when your build is ready to be attached. Click the add icon, select the build you just uploaded, and then click Done. If you have not already, you should configure the rest of the app information in iTunes Connect, which will vary depending on the type of app you are submitting. Now you can cross your fingers and hope that your application is approved! 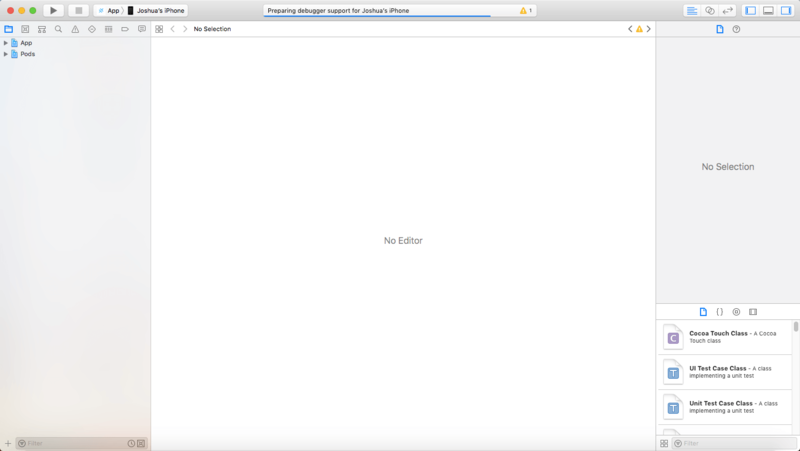 You can use iTunes Connect to check on the current status of your application (e.g. to see if it has been successfully submitted, rejected, or something else). 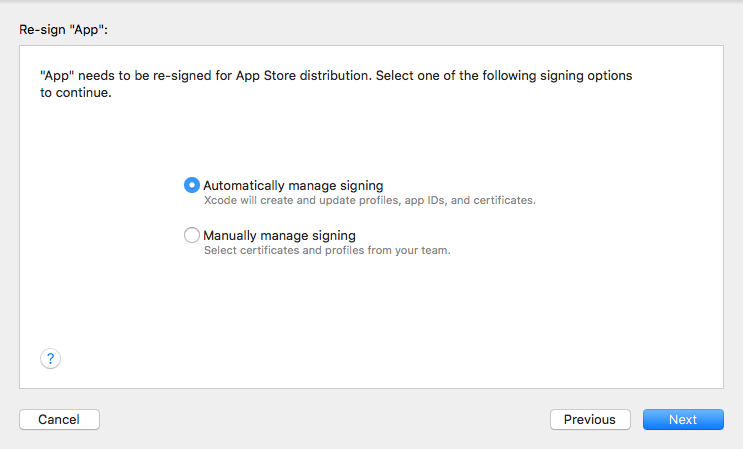 It is quite a lengthy and complicated process to submit to the Apple App Store, but fortunately, XCode does a great deal to simplify this with its automatic signing. A key point to using Capacitor is that you are mostly just working with a standard native iOS project, so most of what we have done here is the same as what any iOS developer would do to submit an application. There isn’t really any specifical configuration required for a Capacitor project.